The November WER report identifies FPSOs likely to come off-field in 2016 and profiles their suitability for redeployment. Details are provided for two new FSRU terminal contracts and we discuss the risk premium on future FPSO leases backed by a long term Petrobras lease. 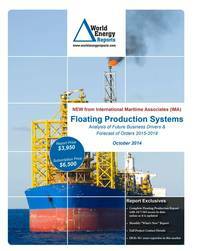 In the data section of the report are details for 251 floater projects in the planning stage, 71 production or storage floaters now on order, 275 floating production units currently in service and 27 production floaters available for redeployment contracts. Charts in the report depict the location where floating production and storage systems are being planned, operating, being built and to be installed. Accompanying excel spreadsheets provide the report data in sortable format. Information is current as of 23 November.